Founder of the Horatio Williams Foundation, Horatio Williams, passing out tickets to the 700 Detroit students he took to Cedar Point. Thirteen 56-passenger charter buses wrapped around the headquarters of the Horatio Williams Foundation in downtown Detroit to take 700-plus Detroit students in matching red shirts to Cedar Point. For the 11th consecutive summer, founder Horatio Williams and his network of friends and sponsors have organized the event, giving so many of the children an opportunity they would not have had otherwise. 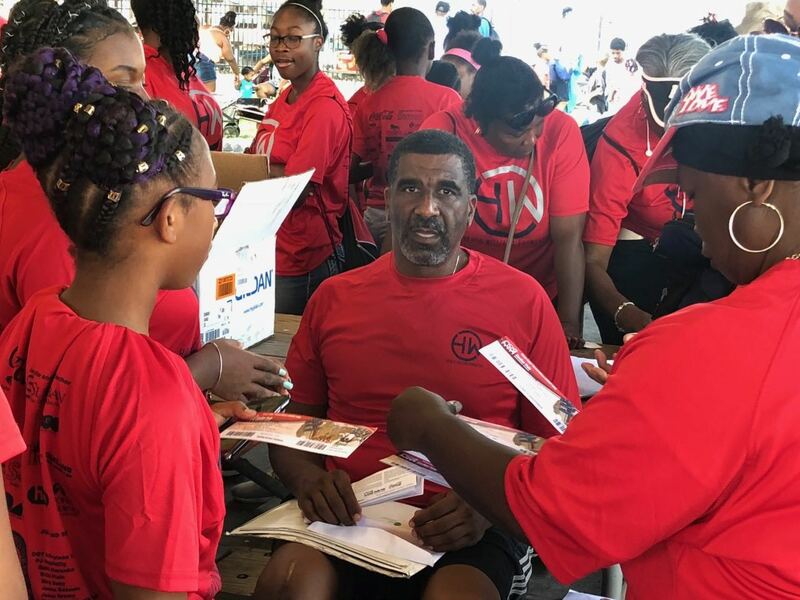 After months of planning, dozens of sponsors, hundreds of volunteers, and thousands of dollars, the fleet of white buses headed south on I-75 to Sandusky, Ohio for a day of fun and fellowship. Scholarship Leadership Service founder Darryl Ervin (seated) with his group of students at Cedar Point. The trip to Cedar Point was completely free for all attendees, which included the bus ride there, entry into the park, a free Dri-FIT shirt, and a free picnic, all made possible by generous donations from the likes of HAP, Coca-Cola Company, Barton-Malow, UAW-Ford, MGM, Karmanos Kids, Coming Attraction, AVL, Suburban Collection, and many others. What started off with one 15-passenger van 11 years ago with Williams and his team, has turned into a citywide effort by some elite corporate sponsors and individual sponsors, making sure deserving children and families in Detroit enjoy their summer in a major way. The 700-plus children who attended Cedar Point were comprised of a number of organizations, non-profits, and churches from all over the city, including the Northwest Activities Center, Butzel Family Center, Scholarship Leadership Service (SLS), Greater Coalition, Detroit Renaissance High’s varsity boys’ basketball team, and many others. For first time attendees such as 7-year-old Brooklyn Hunter, who attended as part of the SLS group, going to Cedar Point was a lifetime experience. So much so, the Matterhorn is now her favorite ride and she returned to her bus with three basketballs, two stuffed-animals, and trinkets for her family, looking forward to the 12thannual trip. “I feel events like this not only allow young people to have a great time, but it also gives them opportunities to meet and socialize with peers from all over the country,” said SLS founder Darryl Ervin. Detroit Edison 2nd-grader Brooklyn Hunter attended Cedar Point for the first time through the Horatio Williams Foundation. The HWF’s annual Cedar Point trip is just a small representation of what the program as a whole is all about. Founded in 2005, the HWF was Williams’ way to give kids in Detroit a second chance, just as he had been given, after being hit by a drunken driver and nearly being killed. A 1986 graduate of Osborn High in Detroit, Williams was a standout in basketball and was surrounded by mentors who assisted him in becoming successful as an athlete, businessman, mentor, and father. His foundation’s goal is to be a lifelong vehicle to helping children become leaders. Their teamwork approach requires every participant to develop trust, build integrity, and give as a servant to their community, while participating in HWF events and programs. Through programs such as ACT/SAT prep, tutoring, financial literacy, women’s empowerment, youth robotics, culinary arts, life skills and leadership, basketball camps, a back-to-school drive and many other programs, the HWF is built upon leadership and nurturing the leaders of tomorrow.